Discussion in 'Cutouts, Wire Frames & Motifs' started by ThaiWay, Jan 17, 2013. I have 15 welded steel snowflake frames that need an update for 2013. This is what they looked like new, wrapped with dumb 2-wire 220V LED rope in 2008. The rope was very difficult to bend and zip tie without breaking internal connections (which was shoddy soldering at best with inferior components.) Over the years it required a lot of time-consuming repair. 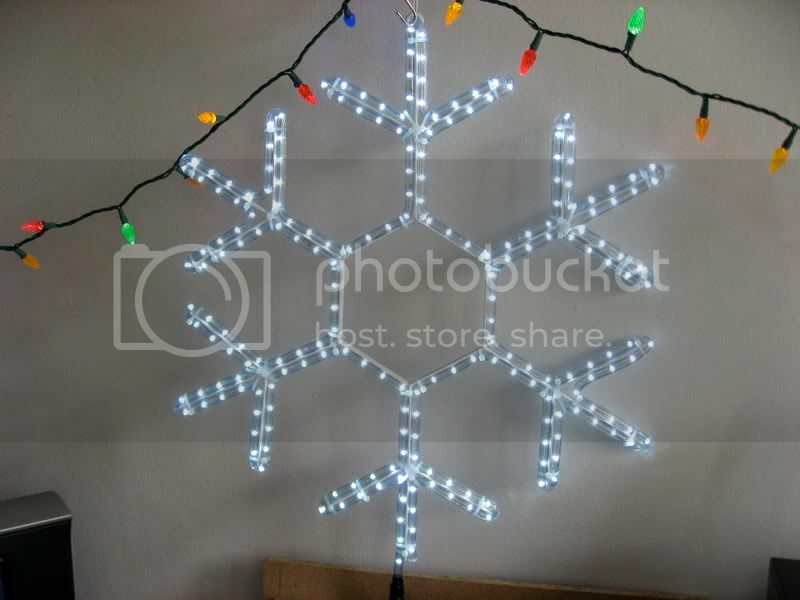 After the 2011 season I never took the Snowflakes down, and now it's trash. The rope is still the same price I paid five years ago (not accounting for the US Dollar's devaluation since then.) At $2/m - available locally - it would cost $180+ to re-wrap all 15, and I could control it again with the Original Lynx 16-ch. But I think the $$$ (and then some) could be better spent doing something completely different and perhaps a whole lot smarter? The first is 36 plastic rectangles modules. Then 120 and 210 nodes respectively. The original rope worked out to be about 216 LED's per Snowflake. I think the 210 node version would be way overkill, so let's take that off the table. Also not considered: flexible strip. The cutting, soldering and waterproofing would be impractical. Now, I could go a number of different paths with the first two options. I'm on a limited budget; cost will be a major factor. But I want the biggest wow-bang for my buck, or as is the case here, for my Thai Baht. Since my current hardware is all Lynx, that would be the place to start. 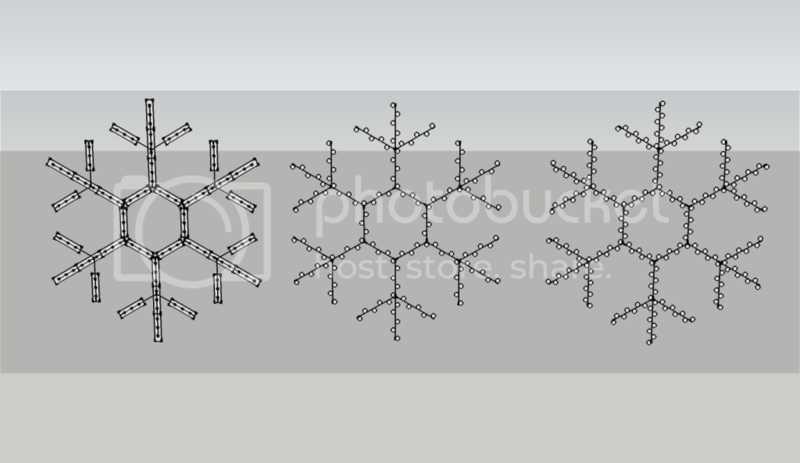 $0.40 X 120 X 15 Snowflakes = $720 + S&H, Total package $1004+++ At 120 Pixels per, this too might be overkill? Maybe 90 per Snowflake? A different path would be to go smart nodes or modules with the E1.31 protocol, using EthConGateway hardware by j1sys. I have spent lots of time studying up on this at ACL (auschristmaslighting.com) At minimum I would need one ECG-P2, a Pixel controller with 2 outputs allowing 4 universes per output (1360 Pixels or 4080 channels.) It can spit out multiple different data for pixel IC's such as the TM1804 and the WS2811. $68 + S&H +++. My only experience so far with RGB has been controlling MR16 light cannons with the Lynx MR16 16 CH DC Controller. Now it's time to up the game to intelligent control. I'm incredibly happy with my wired 8 Lynx Expresses, 6 Original Lynx, an MR16, and the community support at DLA. I get the same feeling at ACL. There is advanced Renard hardware happening now at DIYC but I must confess ignorance. I've never spent a lot of time there. Much is way over my head so at this point I'm not considering it. Cost is going to be the main factor in what I'm able to do this year. Rehab of the Snowflakes is top 2013 priority. Next on the list is rehab of four of nine Minitrees. Thinking smart Pixels with C7 covers; some of those 110V Holiday Creations LED strings are ten years old now! Then, four new Strip Arches. Realistically I think it's doable, but only if I don't go off the deep end on the Snowflakes LOL! If I go rectangles on the Snowflakes, I think I may want to overlay them with coro cut to pattern for some light dispersion = some additional expense. I could save a little if I reflashed my Lynx USB Dongle with Pixelnet firmware. Better would be to keep using it in a new network, or as spare. I'm not thinking about Megatree. Seriously, I'm not. Really... not until 2014. Whatever I do, future flexibility, capacity and compatibility are priorities. I need to start work on new sequences NOW! I'm sure there are other points I can't remember right now. Putting this down on paper - on ether - really helps me try to sort it out in a logical manner. Your comments and thoughts are welcome; that's why I'm here. It looks like you have covered different options. What are the distances between your snowflakes? I too have snowflakes I want to convert. I was looking at RGB rope light myself, but ya its expensive. I like option 2 image as that is similar to my option 2. If I dont do the rope, I am going with the 2811/5050 pixels from RayWu as well. I said no to the modules as I want them to look semi-the same in daylight. the modules are too bulky for me. ...What are the distances between your snowflakes? You're right Eddy. The difference in price between dumb and intelligent is negligible. ...the modules are too bulky for me. Yeah, that is a concern... and apparent just looking at the model picture. But for the price... although if I do a cutout of coro similar to this but based on my pattern it might look really cool. But that would increase the expense too. Thanks for your your comments guys.